Chip Thinning is a phenomenon that occurs with varying Radial Depths Of Cut (RDOC), and relates to chip thickness and feed per tooth. While these two values are often mistaken as the same, they are separate variables that have a direct impact on each other. Feed per tooth translates directly to your tool feed rate, and is commonly referred to as Inches Per Tooth (IPT) or chip load. Chip thickness is often overlooked. It refers to the actual thickness of each chip cut by a tool, measured at its largest cross-section. 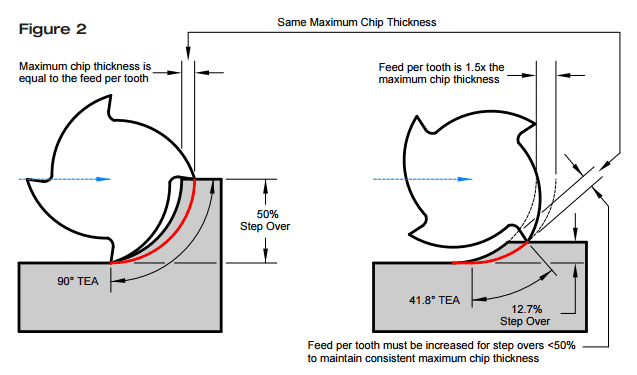 Users should be careful not to confuse chip thickness and feed per tooth, as these are each directly related to the ideal cutting conditions. 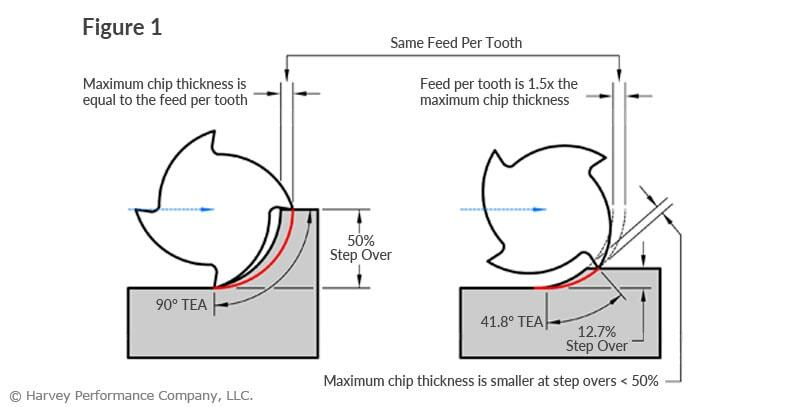 When using a 50% step over (left side of Figure 1), the chip thickness and feed per tooth are equal to each other. 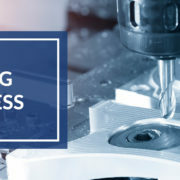 Each tooth will engage the workpiece at a right angle, allowing for the most effective cutting action, and avoiding rubbing as much as possible. 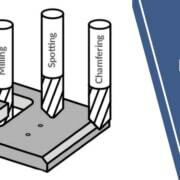 Once the RDOC falls below 50% of the cutter diameter (right side of Figure 1), the maximum chip thickness decreases, in turn changing the ideal cutting conditions of the application. 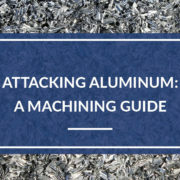 This can lead to poor part finish, inefficient cycle times, and premature tool wear. Properly adjusting the running parameters can greatly help reduce these issues. 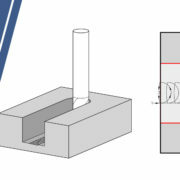 The aim is to achieve a constant chip thickness by adjusting the feed rate when cutting at different RDOC. This can be done with the following equation using the Tool Diameter (D), RDOC, Chip Thickness (CT), and Feed Rate (IPT). For chip thickness, use the recommended value of IPT at 50% step over. Finding an adjusted feed rate is as simple as plugging in the desired values and solving for IPT. This keeps the chip thickness constant at different depths of cut. The adjustment is illustrated in Figure 2. 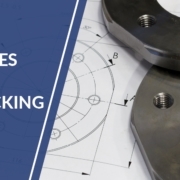 In summary, the purpose of these chip thinning adjustments is to get the most out of your tool. Keeping the chip thickness constant ensures that a tool is doing as much work as it can within any given cut. 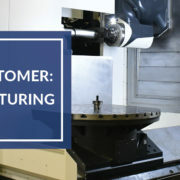 Other benefits include: reduced rubbing, increased material removal rates, and improved tool life. Wow!! I’ve been looking for an explication on chip thinning to better understand how to get the most out of my tooling. Thanks so much! There is a very important reason to use chip thinning. when using Trochoidal tool paths you can use the whole length of the cutter with sometimes as little as 10% engagement and can feed at double the feed rates most of the time. I personally run my SFM a little higher than normal when using this method, it makes for very quick material removal. Even when I am doing normal perimeter cuts I use the technique of taking advantage of using the whole length of cut with 10% step over, your tools will last longer. I mostly use it in hard material but it works well in aluminum and other soft material.